Uninstall | Driver Manager | Manages Your Driver Updates. If you have decided you no longer need Driver Manager on your system, you can uninstall it in one of two ways. Both of these options completely remove Driver Manager from your system. 1. An uninstallation link called “Uninstall” was placed in your Start menu, in the Programs folder, under “Driver Manager”. 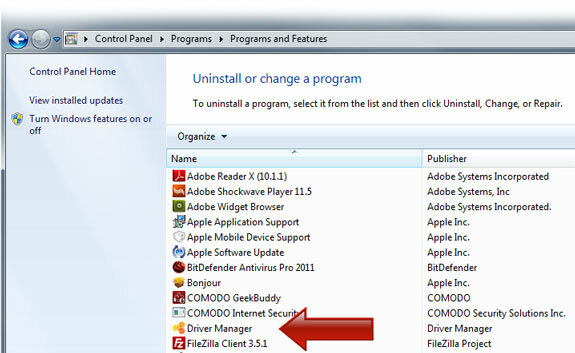 Clicking this link will start the uninstallation process. Go to your Control Panel from the Start Menu. In Windows XP, you will see an icon named “Add/Remove Programs”. In Vista and Windows 7, the same functionality is behind an icon called “Programs and Features“. Double-click on this icon. Here, you will see a list of every application installed on your system. 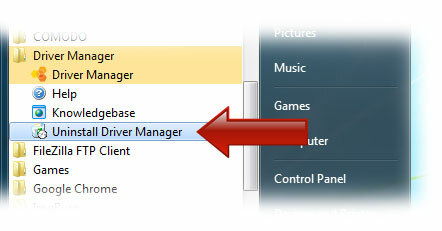 Find the entry for Driver Manager and click on it once to select it. An “Uninstall” button will appear. Pressing this will begin the Driver Manager uninstallation procedure.